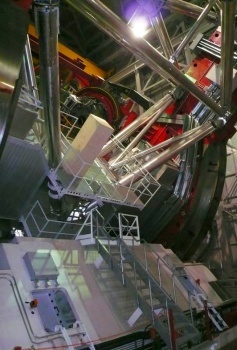 The ARGOS projects will equip the LBT, the Large Binocular Telescope, with an up to date laser guide star and wavefront sensing facility. 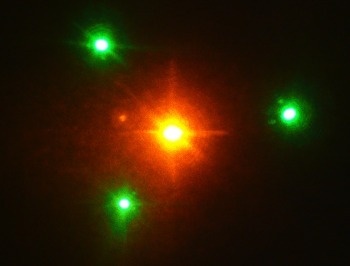 ARGOS will utilize multiple pulsed lasers to generate artificial guide stars. 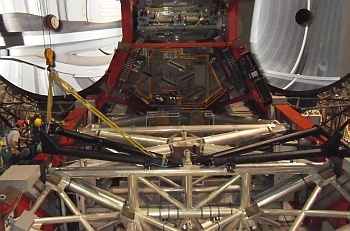 A total of six laser guide stars will be used to correct the ground layer turbulence above each of the LBT mirrors. 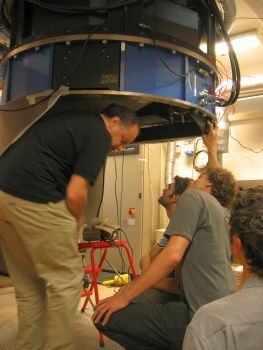 The primary goal of the facility is to correct the atmospheric turbulence induced distortions, thus enhancing the imaging and spectroscopic capabilities for LUCIFER over a wide field of view. 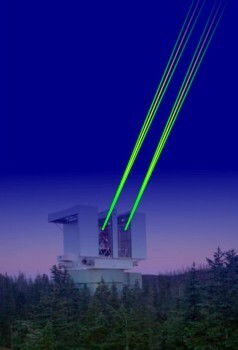 In contrast to usual single conjugated adaptive optics, ARGOS does not reach to the diffraction limit of the telescope. 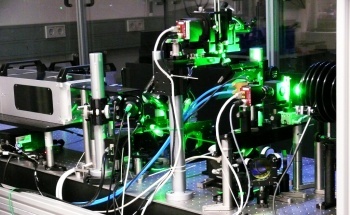 But it will be capable to reduce the seeing by a factor of 2-3 over a 4 arcmin field of view. 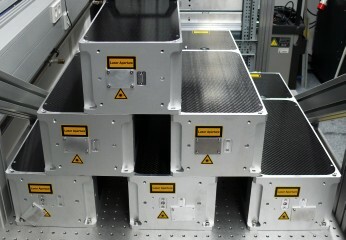 We started to assemble and test the laser boxes. 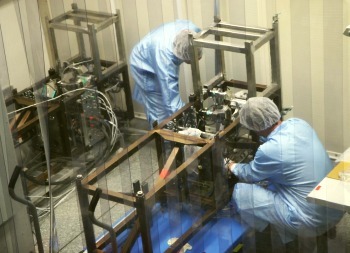 While the DX laser box (background) is already in test, we work on the SX box. First light! 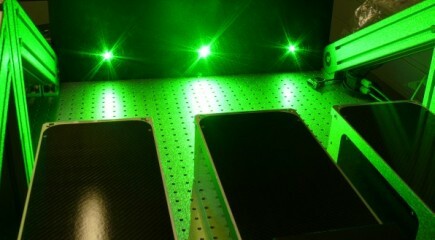 (of the alignment lasers on the ceiling...) High power test will follow soon. 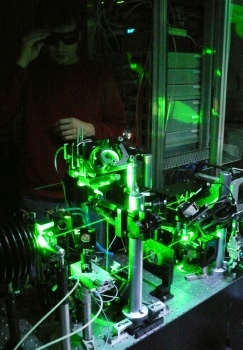 The central spot is the sodium dummy laser. 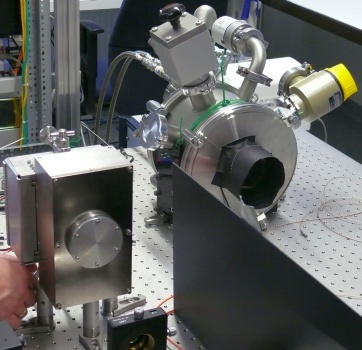 With this test setup we checked how the instrument software, which is still under development, is working with a complex system like our laser box. 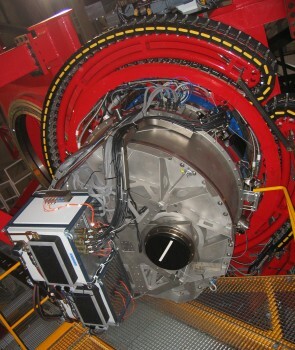 Here it has to handle several motors, cameras, diagnostic systems, safety systems and of course the laser itself. 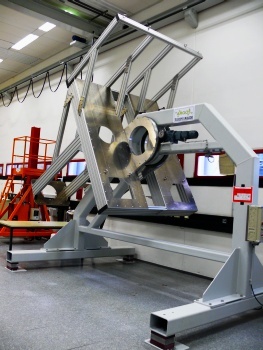 The installation of the calibration swingarm is in progress. Seen on the LBT Live views. LBT with the first ARGOS swingarm on SX C-ring extension. 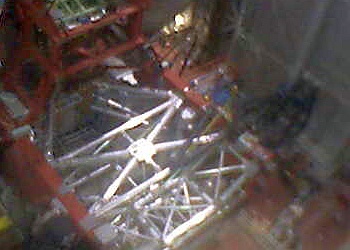 Installation of the second swingarm. We thank and congratualte all the team for this great work! 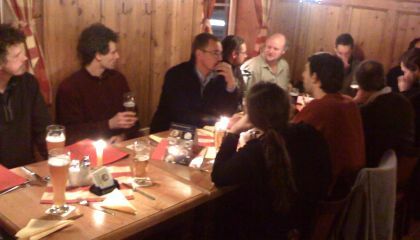 Almost the complete ARGOS team came to Acetri, Florence to join the regularly consortium meeting. In the background, but unfortunately not visible here, is Galileo Galilei's house. 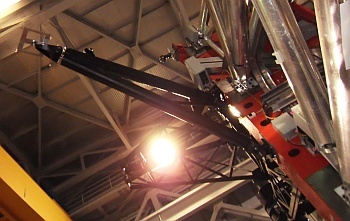 The telescope simulator will help us to integrate and test our laser system or other sub-systems. 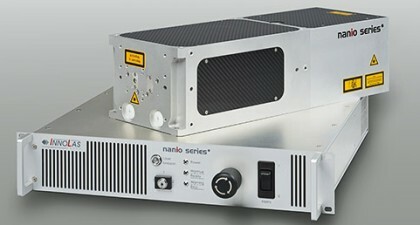 It is capable to rotate 2 laser boxes (6 lasers), together with 4 electronic racks by 0-90�. And a merry Christmas to everybody! 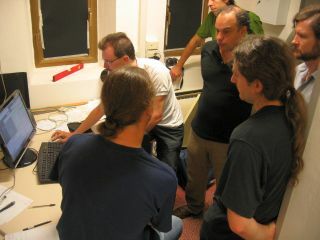 Team members after the delivery: Hans, Sebastian, Julian, Matthias and Thomas. 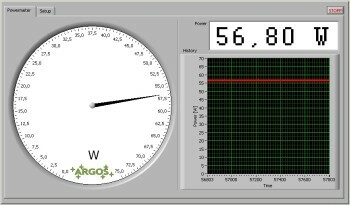 SR: "During the last week the first pieces of Argos have been brought to mount Graham and are now installed to the telescope. 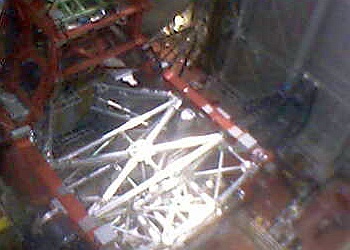 As first infrastructure two rigid platforms for the laser systems surrounded by access platforms and mounts for the racks are now fixed in between the windbraces. 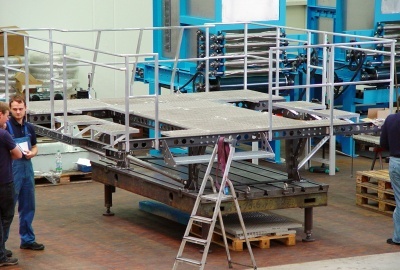 Thanks to the careful design, the excellent campaign planning, our nice and enthusiastic installation team and a friendly support by LBTO, the platforms where installed smoothly, in time and perfect position. 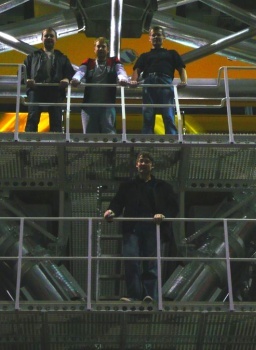 Many thanks to the installation team: Hans, Matthias D, Mathias H & Stefan! " 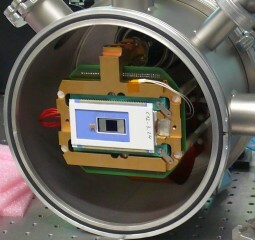 The 2 platforms and a dummy electronics box are installed to the LBT. 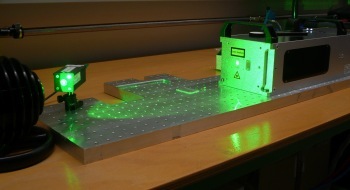 The laser launch and supply platforms were manufactured and accepted. Now they will be painted, shipped and installed to the LBT. 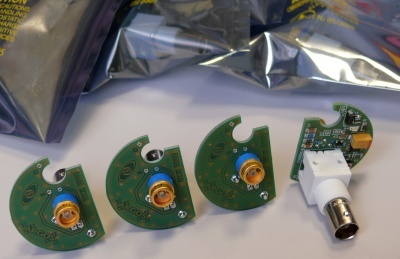 In the meanwhile the first electronics parts were manufactured. 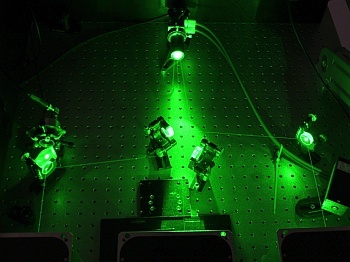 Here the fast photodiodes, used for the laser diagnostics. 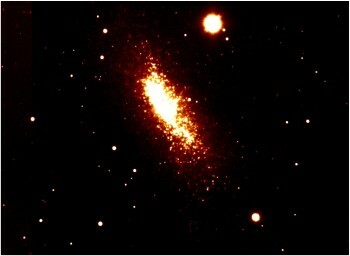 pnCCD 2. genreation (left). 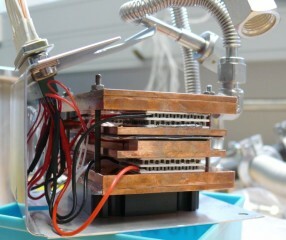 While the first test system (right) was cooeld by a Stirling cooler and an always running vacuum pump, the new one is cooled by peltier elements. This was a big step towards the final design. 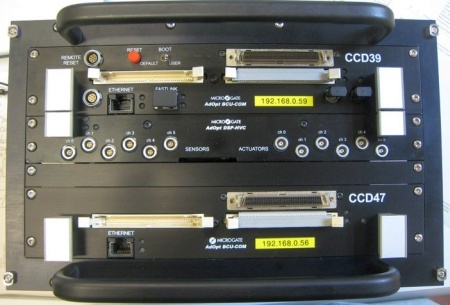 The Microgate BCU with a high coltage controller. This will capture the the data of our wavefront sensor and control a tip-/tilt-piezo mirror to stabilize the incoming light. 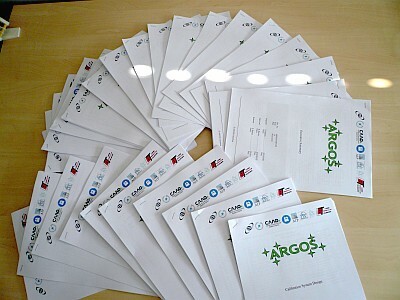 The Argos final design review just has finished with the panels judgement that we have 'passed' ! 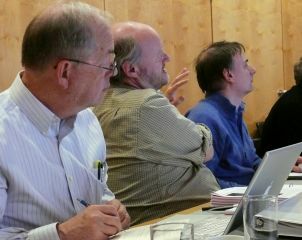 The Final Design Review in Tucson. Close co-operation between ARGOS and LUCIFER. Testing a lot of our final stuff: 3 lasers on one heat exchanger, the water cooled power meter and some small electrical devices. First test of 3 lasers on one heat exchanger. Already operated with 120V/60Hz. 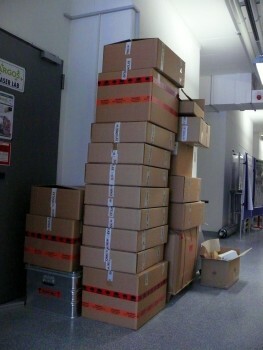 Ready for the telescope: six lasers for six stars. 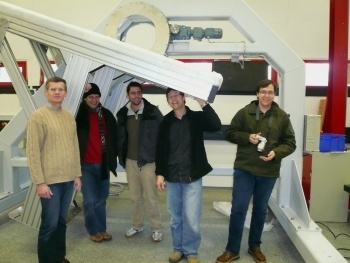 Visit of the Solar Tower at INAF during ARGOS consortium meeting in May 2009.
is tested here with the AGW unit. Demonstration of the adaptive secondary. It works! 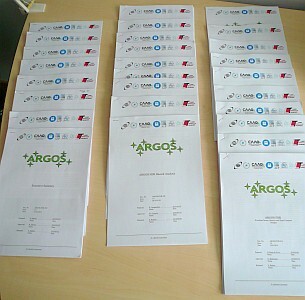 The ARGOS consortium is assembled from the LBT partners. Please see the dedicated web page.